J.G. Ballard wrote some fine landscape pieces in Cocaine Nights (1996 ) on an imaginary but all-too-real Costa del Sol, the archetype of all the Costas. A frightening contemporary vision of the present-future of this part of Spain. Note Sotogrande does not exist. The mountains had withdrawn from the sea, keeping their distance a mile inland, Near Sotogrande the golf courses began to multiply like the symptoms of a hypertrophied grassland cancer. White-walled Andalusian pueblos presided over the greens and fairways, fortified villages guarding their pastures, but in fact these miniature townships were purpose-built villa complexes financed by Swiss and German property speculators, the winter homes not of local shepherds but of Düsseldorf ad-men and Zürich television executives. The retirement pueblos lay by the motorway, embalmed in a dream of the sun from which they would never awake. As always when I drove along the coast to Marbella I seemed to be moving through a zone that was fully accessible only to a neuroscientist and scarcely at all to a travel writer. The white facades of the villas and the apartment houses were like blocks of time that had crystallised by the side the road. Here on the Costa del Sol nothing would ever happen again and the people of the pueblos were already the ghosts of themselves. The destruction of the Spanish coastline is subject to this slideshow in today’s Guardian. 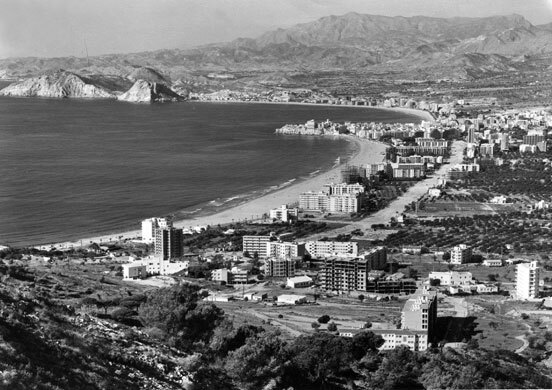 In the photos below, Benidorm in 1960 and in 2009. A graphic example indeed, though I think the sprawl of second homes in the last twenty years has done much more harm and benefitted far fewer people. Also in today’s Guardian: Campaigners warn of threat to one of Spain’s last pristine beaches “Politicians have long promised to bulldoze the Algarrobico hotel, but the 411-room glass and concrete structure still towers over the El Algarrobico beach in Almería, south-east Spain. Now campaigners say the authorities have changed their tune and are opening the way to more building on this stretch of protected Mediterranean coast. In the six years between 2000 and 2006, urban development within the first two kilometers of the coast of Huelva increased by 48.1 percent. 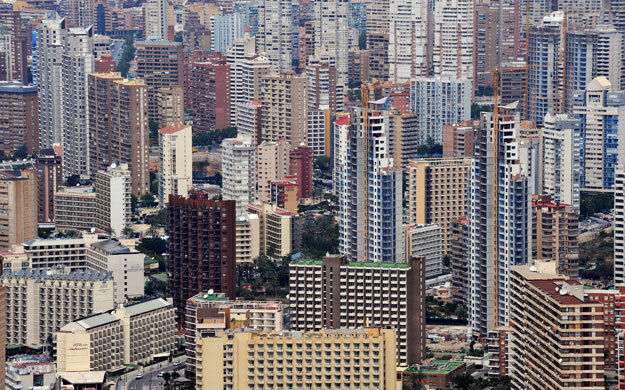 Urban sprawl in Valencia increased by 53.1 percent. In just six years, concrete was blighting one out of every 10 previously untouched kilometers of Valencia’s coastline. In Alicante and in the Andalusian province of Málaga, more than half of the first two kilometers of coast are under concrete. In Barcelona, just 32 percent of the coastline remains undeveloped. 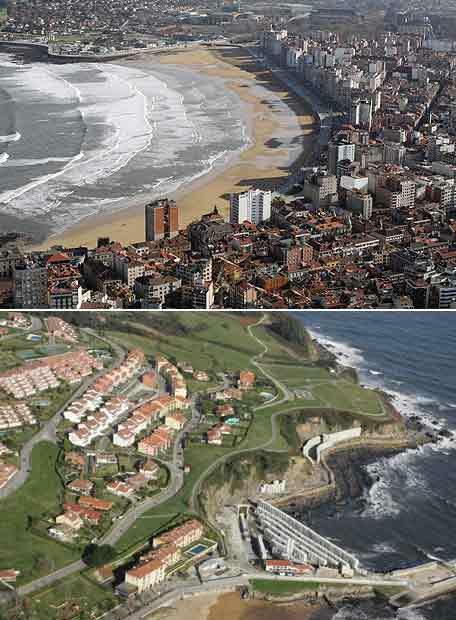 Across Spain, coastal urban sprawl has increased by 22 percent in just six years. Today, the 13th November, is five years since the Prestige disaster. El Pais reminds us that nobody has yet been tried for this. 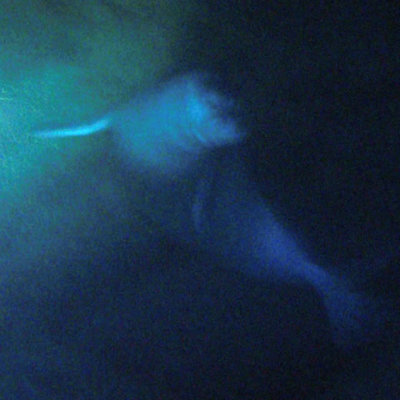 The spill is the largest environmental disaster in Spain’s history.